WARNING: Prepare to Fall in Love! At Ambience we have amazing customers and people who make a difference. Kristen from Treasured K-9s dropped off calendars to support the rescue and adoption of amazing dogs, focusing on the Jindo, and all proceeds go to care and adoption of these dogs. 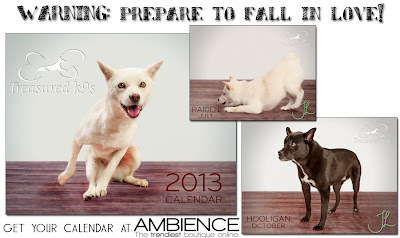 The calendars are amazing, will make you smile and be careful as you may fall in love with one of these dogs, really they are mad cute! Swing into the store, take a look, the images are so gorgeous; you can frame them if you like. Get a great gift that benefits the rescue efforts of amazing dogs.